8 Wedding Hairstyles for Long Hair. Whether you're the bride, a bridesmaid or a guest at the wedding reception, you want to look gorgeous and impress others with one of the most beautiful long wedding hairstyles that will perfectly complement your dress and shoes. Here are our suggestions – all you have to do is take your pick! The twisted low updo is one of the best wedding hairstyles for long hair because it's very classy and elegant and will frame your face beautifully. Plus, one of the things that makes it a great choice when it comes to the best long hairstyles for a wedding is the fact that it works perfectly with any hair color. So, in order to get the twisted low updo, add a little volume at the roots and side part your locks at the front before gathering your hair at the nape of the neck, centered or side swept, and securing the hair with an elastic. Next twist the hairs and secure them with bobby pins before spritzing some hairspray for extra hold. If you want to look chic on your big day, then you should add this hairstyle on your wedding hairstyles for long hair list. You should separate a hair section at the crown and secure it with two bobby pins placed horizontally. Then take two hair strands from each side of the head and wrap them at the back of the head before securing them with two pins. Divide the remaining hair into 3 sections and twist the centered one into a knot. Wrap the remaining two hair sections around the knot and add some pins to secure it. If you love simplicity, this is probably one of the greatest wedding long hairstyles for you. 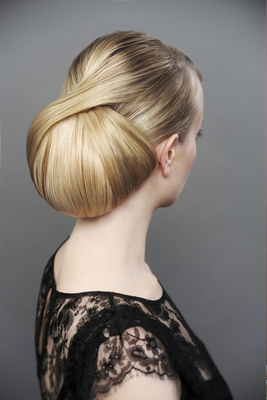 A simple ponytail can add sophistication to your look. You should pick a hair accessory that will transform your entire apparel. Choose a flower, a hair band or a princess tiara and get ready to wow the audience at the wedding reception! For those of you looking for a more classical approach, the low knot might be the perfect option when it comes to wedding hairstyles for long hair. You can try to leave some strands loose in front before pinning the hair into a very simple low knot. So, if you're looking for an extremely fashionable, yet simple wedding hairstyle, a low knot might be the perfect solution. You should also try this great wedding hairstyle for long hair. Just think of the 20s flapper girls that looked fabulous with their wavy hairstyles and fringe dresses! Make a statement and add a gem hair brooch to your vintage waves hairstyle as it will make your ensemble look more sophisticated. In the end, you'll definitely be pleased with this timeless look. Did you dream of becoming a ballerina when you were little? If so, why not try this lovely long hairstyle for a wedding? A ballerina bun will make you look great and very stylish, especially if you're complimenting your look with a great headpiece. Moreover, you can also mix it with blunt straight bangs. This wedding hairstyles combination will shift the attention towards your big and beautiful piercing eyes. Plus, you'll get to dance all night long and enjoy your big day without worrying about your hairstyle. 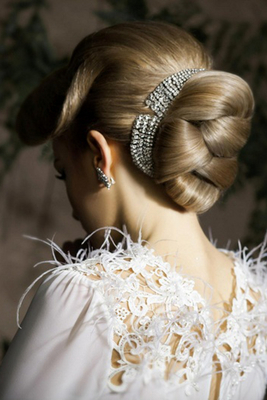 If you're into the angelic look, then this might be one of your favorite long wedding hairstyles. Wavy hair does justice to your long tresses and they match almost every face shape. 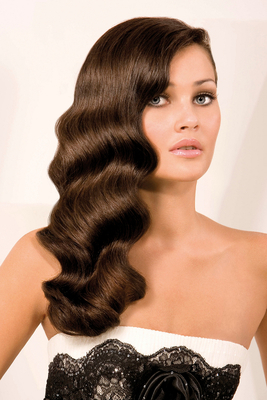 Moreover, hair waves give you a heavenly look that will mesmerize other guests. 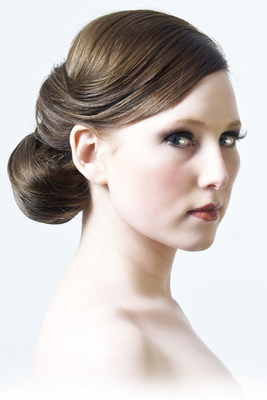 You can match this wedding hairstyle for long hair with a natural makeup and you'll look great! Braids are definitely amongst those chic wedding hairstyles to be added to your list. Soft thing braids can be incorporated into an updo hairstyle to provide you with a touch of softness. If you're into princess-themed weddings, you should ask your hairstylist to add some fresh flowers to your braids. You'll look super chic and feminine with your braided updo hairstyle!